Last week I shared Part 1 of my Fitness & Health Bloggers Conference Wrap-Up (“Eat less, move more” is bad advice). Now I’d like to share another highlight of the conference: The lecture and demonstration by Iñigo San Millán, PhD, director of the Anschutz Center’s Exercise Physiology and Human Performance Laboratory. Dr. San Millán (@DoctorInigo) is an exercise physiologist who works with elite and world-class athletes, including six Pro Tour Cycling Teams, a Tour de France winner, and sixteen Grand Tours podium finishers. The guy really knows his stuff. Also, he’s nice. And funny. On the first day of the conference, Dr. San Millán’s presentation, Pursuing Metabolic Health – What we have learned from Elite Endurance Athletes, discussed the differences between elite athletes and, well, the rest of us. The idea is that if we can understand elite athletes’ bodies work, we can find ways to apply that knowledge for everyone else’s benefit, too. Elite athletes are more metabolically advanced than the rest of us, with “central adaptations” (heart, lungs, veins, arteries) and “local adaptations” (at the cellular level). These central adaptations of their cardiorespiratory systems give them increased cardiac output and capillarization, improved delivery of Oxygen to their tissues, and greater VO2 max. Performance at the cellular level makes a difference on how the body works, too. Remember mitochondria, from your high school biology class? They’re the “power house” of the cells, converting stored energy into usable forms. There are two ways to get rid of that extra lactate. The first is for it to travel to the liver and be converted back to glucose, ready to be used for energy again. The problem with that, though, is that it can take several minutes for that to happen — which isn’t fast enough during strenuous activity. The second way is for the mitochondria in your muscles to do the work of removing the excess lactate. Therefore, by having more mitochondria — and having them perform well — it’s possible to remove more lactate with greater speed and efficiency. It turns out that elite athletes have a greater “mitochondrial density” than the rest of us. Quite simply, they have more mitochondria — and their mitochondria may be larger and more effective. They are therefore able to convert fuel to energy and eliminate lactate build-up far better than the rest of us. We can measure lactate in the blood to track the level of lactate metabolism. At rest, lactate levels are around 0.7 (mmol/L). As the muscles are pushed harder and harder, the lactate levels build up — once they reach levels in the range of 5, fatigue is setting in hard — and by 8 or 9, your muscles become essentially useless. 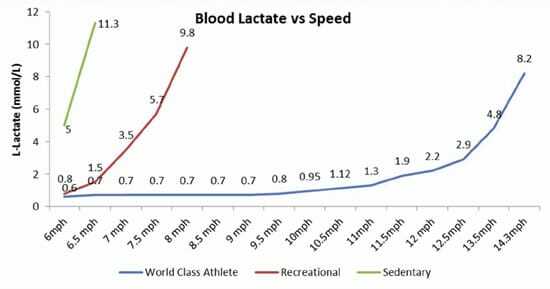 Below is a graph of lactate levels in the blood versus running speed. Comparing the three populations — sedentary people, recreational athletes, and word class athletes — the difference is profound. When the sedentary and recreational folks are already finished, the world class athlete hasn’t even broken a sweat. She can sustain a speed of 9 mph (that’s a 6:40 mile, what most of us would call a sprint), and her lactate levels will still be at 0.7. Once she speeds up, you can see the levels increase — until finally, at 14.3 mph (a 4:20 mile), she’s cooked. 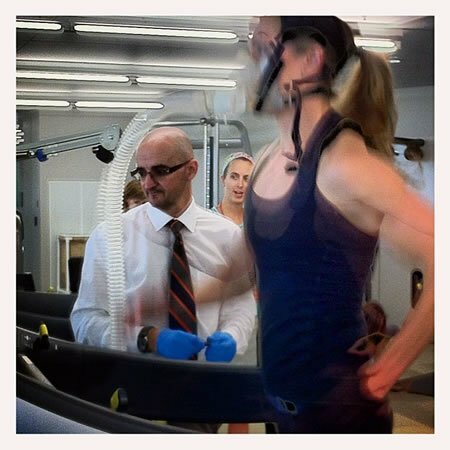 The picture at the top of this post shows Dr. San Millán administering a performance test on a (very gracious) trainer from the Anschutz Center. He had her run on a treadmill as he increased the speed every few minutes. The mask she’s wearing is for measuring her VO2 max, a test of her ability to transport and use oxygen. And the reason he’s wearing those blue gloves? Every few minutes, he took a drop of blood from her fingertips and checked her lactate levels. My biggest take-away from this test was that VO2 max is an important level of testing, but it’s not the whole story. Her VO2 max was excellent (about 51, if I recall correctly) — but her lactate levels didn’t perform quite as well. The verdict was that she is actually quite fit — but because she usually trains with short-burst, high-impact activity (like kick-boxing! ), when she runs at higher speeds, her body isn’t as used to it. Make sense, right? Only by testing both VO2 max and lactate, can you start to assess overall strengths and weaknesses, and develop a customized training program. Since her VO2 max is excellent, we know that she doesn’t need more high-impact training. What she really needs is more endurance training, such as running at slower speeds for longer times. That’s because endurance training increases the Type I (Slow Twitch) muscle cells, which can gain more mitochondria, which can help with lactate processing. This isn’t all just about elite athletes. The idea is to figure out what’s different about elite athletes, and then find a way to apply that knowledge for the rest of us. Putting it all together, it becomes about improving overall metabolic function, whether you’re a couch potato or marathon runner. A lean, aerobically fit individual who exercises regularly will be “metabolically flexible.” Her body will process food (or a lack of food) efficiently — that’s why elite athletes can eat anything they want (and load up on the refined carbs!). Flipping this research around, so the theory goes, someone who is obese and aerobically unfit, may be “metabolically inflexible.” They may actually have “Mitochondrial Dysfunction” or “Mitochondrial Atrophy” — and the way to improve that is, of course, through exercise. That’s not all that surprising, of course, but I found this to be a revelatory way of looking at the “diet vs. exercise” conversation. As we’ve seen again and again, the two are inextricably linked. For most of us, it’s really quite simple — everyone can benefit from increased activity and the right kind of training. As I summarized in a tweet during the conference: More activity = more mitochondria = better metabolism = better health/lower weight. Too bad Millán didn’t mention that the biggest difference between “us” and “elite athletes” in cycling most likely are copious amounts of EPO, testosterone, salbutamol and others. Especially because during the 2007 Tour de France, when he was Team Astana’s medical advisor and head physiologist, Alexander Vinokourov tested positive for blod doping. Well done, sir! Excellent placement of a graph. It was a pleasure having you at FHBC and I’m glad you got so much out of it (especially all the big words!). Your blog is fabulous and I really enjoy your evidence based approach. This research makes a lot of sense to me but I had a question about the graph. The graph uses “elite athlete” as a broad term. Did Dr. Millan use a spectrum of elite athletes in his research? I ask because it seems that different skills would create different responses in the blood lactate vs speed graph. I’m curious if the elite sprinter, marathoner and power lifter would all have similarly low levels of blood lactate. Thanks for the excellent resource you provide! wow! Great summary of this segment. You took detailed information and really made it simple!